Short Summary: Models continue to show the potential for a signficant snow event Saturday into Monday. Can you tell me how much?? It is still too soon to throw out amounts. Most model data is showing 1 to 2 inches of liquid falling out of the sky for the event, and most of that is snow. There is a risk of some mix, all regions but especially southside regions. (Snow is usually 10 to 1 ratio, so 1 inch of precipitation is 10 inches of snow. What can go wrong and we won't get any or much snow? There is quiet a bit that can go wrong. 1. Storm remains too far south and we get fringed. 2. Storm comes too far north and we flip to ice and rain. Both are possible. The models currently oscillate between a great track for our region and a tad suppressed, especially the regions north of HWY 460. I don't post snow maps 5 -6 days out. It's poor taste and people struggle with uncertainty. Simply beause the models change doesn't mean the event isn't or is happenning. With that, some of the crazy runs had a large swath of 20+ inches across our region. This was accomplished by the primary batch of snow targeting our region and then the upper air support taking a great track that keeps it snowing another 12 hours that racked up the 20+ inches. Not a likely outcome, but could be partially right where we get the majority of our snow Sunday then a second batch falls into Monday Morning. When will you give us accumulation ideas? If the model data is consistent, I will blog up tomorrow "floors and ceilings".. Meaning, if everything goes wrong we can expect XYZ if Everything goes right we can expect XYZ. There has been chatter about this event for several days now so I figured I'd write up rather than short tweets and posts that lack detail. Cold air filters in as an impulse rides along the sub tropical jet. This means timing is everything. Some runs are slower with the storm and the cold air is LEAVING meaning a chance to ice/rain while others are too fast with the storm and the cold air isn't here yet, meaning rain to ice to snow. Models that show the storm starting overnight Friday are warmer to start while others that Delay the onset to Later Sunday end as Rain. Expect a strong influx of snow maps from every backyard forecaster. Take them with a grain of salt. They often include what would fall as ice/sleet and even rain as snow. They are useless at this time, and quite honestly most of the time. Anyone who says they have a strong idea on what will happen at this point is foolish. Don't trust them. Many of you may know I am Family Counselor in real life and in both meteorology and counseling, you have to be comfortable with gray areas and uncertainty. This is the case here. 1. It's early in the seasonan and we don't know the seasonal biases on the models yet. 2. We will have to deal with always present adjustment north modesl do as we get closer. 3. It's a long ways out so the data will have several changes and adjustments. Places along and West of the Blue Ridge and north of Hwy 460 have the best chance of a plowable snow, with some ice mixed in, places south of that region may still see snow but now as much and an increased risk of ice/rain. I will start tweeting and posting maps and thoughts will more comprehensive blogs when I need to convey more information. Thanks for sharing with your friends and family. Winter "Pre" Previews are trickling out.. If you like cold and snow you will LOVE..
Winter outlooks done by mets/ weather hobbyists are more fun than accurate at times but they do make fodder to read and post. I've noted a few notable mets with early previews and others tossing hints. 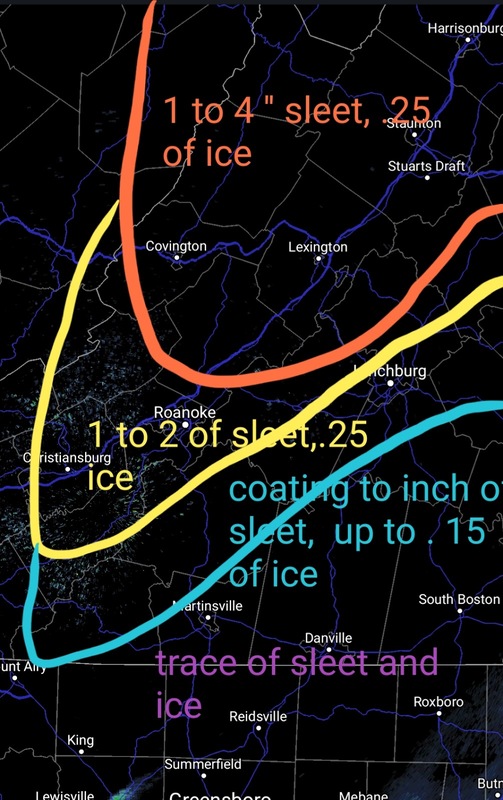 I have some early thoughts for the areas including Lynchburg, Roanoke,Danville and Blacksburg. 1. We will most likely have a low to moderate Modoki El Nino. This means the Pacific, especially in the mid pacific known as Regions 3/4 will be in an El Nino phase. 2. The PDO should be positive- Warmer water closer to the north pacific coast from Alaska down towards the US will be warmer. 3. The Atlantic MAY be more favorable for high lattitude blocking in the NAO and AO regions. If you have every kept up with my blogs, those are all really good things if you like cold and snow. We always blog from the perspective that snow is a good thing,. A modoki El nino is the closest winter to a consistent theme. Most end up remebered for being fairly cold and rather snowy. Winters with similiar patterns were 86/87, 02/03 09/10 with other years having lesser levels of commonalities. 86/87 is remember for have back to back 10-14 inch snowstorms in our area from Jan 22 to 26. Region had 30 to 60 inches of snowfall. 02-03 had MANY storms in the 3 to 6 range and a BIG storm ended up being sleet here (in the 3-6 inch range of sleet). The region had 20-50 inches of snowfall for the winter. 09/10 had 2 storms over a foot and another get really close. Snowmaggedon dumped close to 15 to 30 inches region wide over a few days but DC north had 40 or more inches in a 10 day stretch. Seasonal totals were 25 to 50 inches region wide. With that, nothing is every a lock-- especially before we have an offical El Nino and a few other variables. Temps regions wide-- Seasonal 1-3 below normal for the winter. Danville region/southside- 10 to 20, but a lot wiggle room for more. Lynchburg Area 18 to 28 inches, with higher end potential. 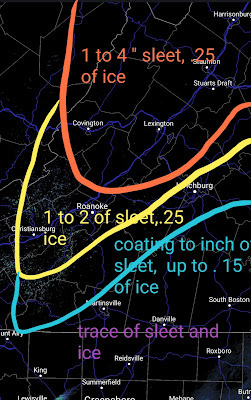 Roanoke Valley region- 21-31 inches, potential for more. 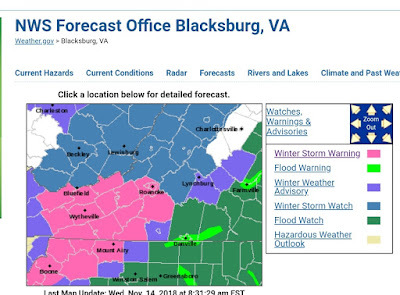 Blacksburg, NRV and Highlands Region- 25-35, even more in Lake Effect areas. Also, potential for much higher totals. Each city's top 10 snowfall winters has 2-3 modoki winters in those totals. Modoki El Nino's are known for having 2 or more LARGE events of over 10 inches.. once snow gets into double digits around here, it's a memorable event. There is also a "hot" period from around January 20th until February 10th or so that has a historical precedent these large events with other events being more scattered thoughout the winter season. That time period is often easily identifed in advance by-- Modeling showing strong blocking in the Artic/Greenland region (Negative A0/NAO cuplet) positive PNA(Ridge on the west coast) and the SOI (Southern oscillation index) dropping 7-10 days in advance. (This is tied into the sub tropical jet becoming active)If that happens we could pop 2-3 winter events in a 7-10 day period. A couple runs of the seasonal runs from the Canadian Model and European model showed literally perfect 500 mb maps if you wanted a cold and snow winter for December to March. These maps displayed blocking on the west coast and artic/NAO regions with clear evidence of a strong sub tropical jet. 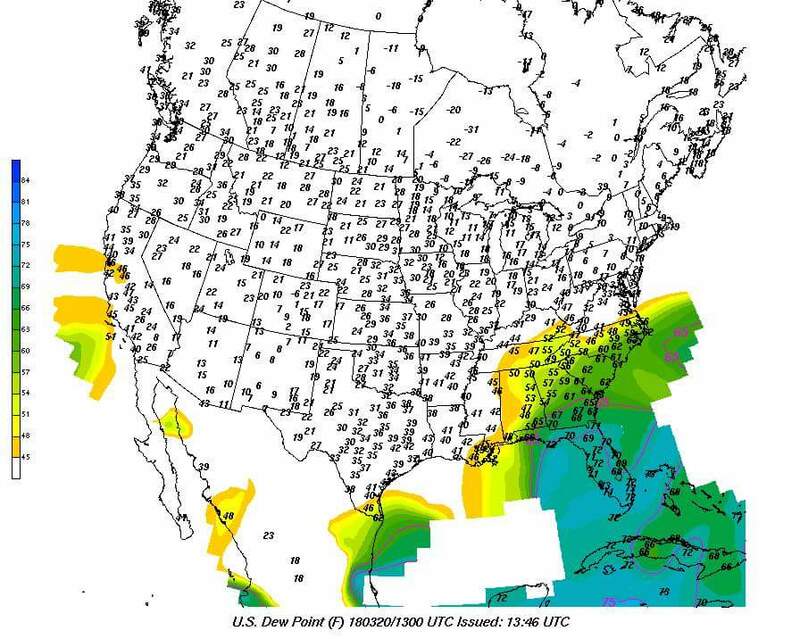 Sub tropical jet is very important for our region because we do sit far enough south that we need a pretty unusual pattern to have the northern jet suppressed for snow in our region. With that, we are only on August 18th and a lot can and will change. It is completely possible that we have all the pieces I cited in perfect alignment and we end up with a rather tame winter. This outlook previews where I am likely heading, but will updated my thoughts hopefully by late October.